This 100% cotton, acid-free, machine-made paper is excellent for drawing and printmaking. Stonehenge Light Paper accepts layers of wax-based/oil-based colored pencil without buildup. Good for graphite, charcoal, pastels, and watercolors. 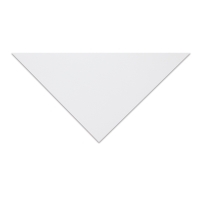 50 lb (135 gsm). 30-sheet pads. 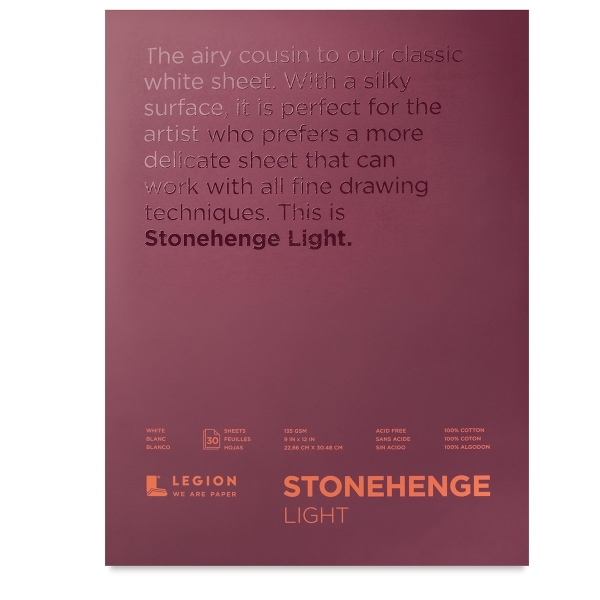 Available in 30-sheet pads, Stonehenge Lightweight Paper can accept multiple layers of wax-based and oil-based colored pencil without buildup, allowing colors to penetrate and be absorbed into the sheet. It is also excellent for use with graphite, charcoal, pastels, and watercolors. 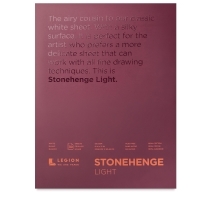 Stonehenge Lightweight Paper is endorsed by the Colored Pencil Society of America. 50 lb (135 gsm).